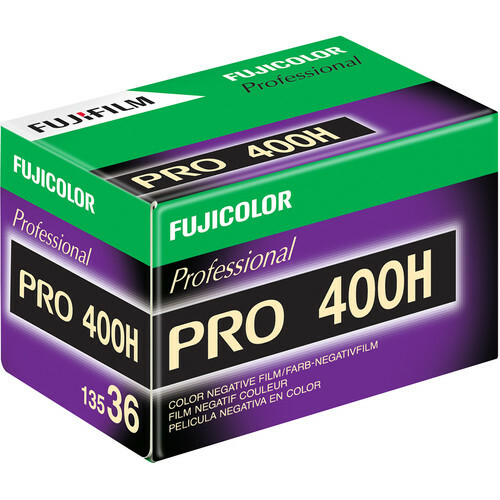 Box Dimensions (LxWxH) 2.3 x 1.45 x 1.35"
Fujicolor PRO 400H Professional Color Negative Film (35mm Roll Film, 36 Exposures) is rated 4.9 out of 5 by 114. Rated 5 out of 5 by Nicholas from My Favorite Color Negative Film Pro 400H produces possibly the best, most neutral and accurate colors of any negative film on the market. Colors are accurate and well saturated while skin tones remain pleasing, without any redness or other harshness. All in all a fantastic film stock. Scans, develops, and enlarges well / consistently. Rated 5 out of 5 by Rohan Gupte from Most beautiful film Give this film plenty of light and you will be rewarded. Gentle color palette that renders gorgeous skin tones. Just make sure you shoot bright since some of the shadow areas do tend to get a bit murky with grain. My favorite film to use while making portraits out in the sun under broad daylight! Rated 5 out of 5 by Thomas from My Favorite C-41 The colors of brown and white skinned people are very accurate. The Greens are classic fuji green. I'm amazed at how far I can pull shadows out of a file made with a good quality scan. Rated 5 out of 5 by JKM from Excellent 400 Stock After looking at the few competing 400 stocks, it seems like the only comparable options are Kodak Portra VC and NC. I find both of those films to be a little disappointing in one way or the other, but Fuji 400H seems to strike a great balance - vibrant but not exaggerated, natural but not muted. I use it for cloudy-day landscapes and for humans, and it performs very well for both. I use Ektar for my brighter landscapes, and I find that while 400H has a look all its own, it is a good counterbalance for lower light shots. Rated 5 out of 5 by Anonymous from A great film for any occasion I am normally a Kodak user, but wanted to see how this film compared, and I can honestly say I have walked away impressed. So much in fact, that this will likely become my everyday 400 speed film. This film produces great results with hardly any trace of graininess and a great color balance. Not super saturated and contrasty, but not as subdue as with Kodak's Portra 400. While I would still turn to that film for dedicated portraiture, this film is an excellent all-round go to that adds just a little punch that is great for landscapes and general shooting while still remaining acceptable for portraiture as well. This film also has a great exposure latitude, similar to Kodak's, and it produces vivid and detailed prints even in bright sunlight. I honestly can not think of any reason not to buy this film, and being such, I will likely be buying it again. Rated 5 out of 5 by Blue Coral Photography from Best affordable color film out there. This film just works giving great realistec colors and amazing subtle grain. Contrast is great and not too harsh and you can push/pull with no problems. I overexpose it quite a bit to reduce some of the contrast and create more pastelle colors. Rated 5 out of 5 by Anonymous from Still my favorite color 35mm film I have been shooting with Fuji Pro 400H for about six years now with my Nikon FE. While I've played around with loads of different films, from cheap Chinese films like Lucky 200 to Kodak Portra and Agfa, I keep coming back to the Fuji 400H. It is consistent, with crisp colors and clean images. Low grain and beautiful prints. Love this film! Rated 5 out of 5 by Anonymous from Professional film The quality of this film is stunning. The fine grain and the cold temperature look is amazing. For authentic feeling of the situation. Expiration date of Fujifilm Fujicolor PRO 400H Professional Color Negative Film (35mm Roll Film, 36 Exposures ???? It would be printed on the box. Is this particular film DX Encoded? Yes. Drop it in and shoot away. One thing to watch for is free felt/lint fibers from the light seal.